Photo: Rachael Quisel Panelists (left to right) Ashe Kelly-Brown, Christin Brown, Diana Pereira, Michelle Greer, Lena Requist, Jennifer Somer, Mary Kennett, Leslie Zemeckis, Kerri Murray and Stephanie Cuevas (speaking). More than 100 people gathered in the Riviera courtyard of tech company Ontraport campus on March 7 in honor of International Women’s Day. 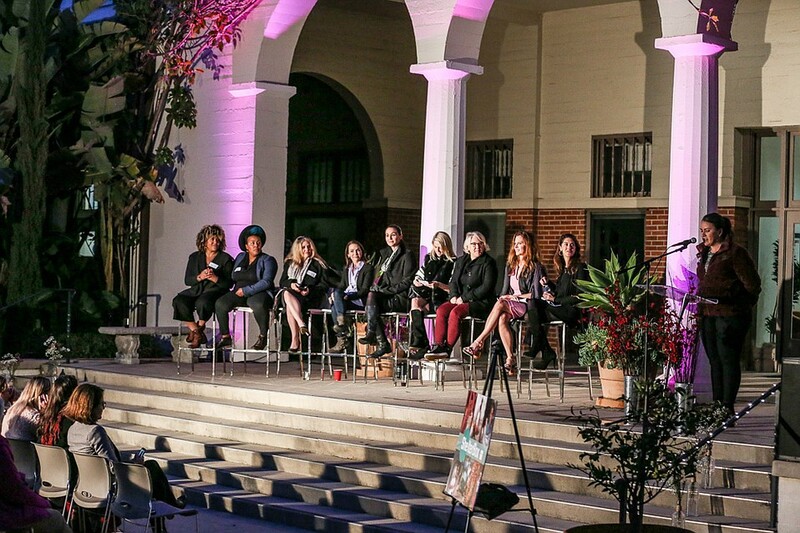 The event featured a panel of Santa Barbara business leaders, as well as live music by Girls Rock, a Santa Barbara nonprofit that empowers girls through music education and performance. With the theme “Balance for Better,” event organizers put an emphasis on creating a gender-balanced world, particularly in workplaces. Even in supposedly progressive Silicon Valley, women trail behind men substantially in business leadership positions. According to a 2016 study by Mountain View law firm Fenwick & West, 43 percent of the 150 highest-earning public companies in Silicon Valley had no female executive officers. However, this leadership gender gap isn’t evident at Ontraport, a Santa Barbara-based company that makes CRM and marketing automation software. At Ontraport, women hold nearly half the company’s leadership roles. For International Women’s Day this year, the company brought together a panel of nine female business leaders to share their stories and change the narrative around leadership. The all-star speaker list included actress, author and award-winning documentarian Leslie Zemeckis; UGG VP of Women’s & Lifestyle Jennifer Somer; owners of Pura Luna Women’s Apothecary Ashe Kelly-Brown and Christin Brown; Senior VP of People at Procore Technologies Michelle Greer; Head of People & Experience at Deckers Brands Mary Kennett; ShelterBox USA President Kerri Murray; Co-Founder of Impact Hub Diana Pereira; and Ontraport President Lena Requist. Gender inequality affects the corporate world, too. “Being the only woman in the room, on the stage or at the conference, it’s easy to be overlooked unless you’re willing to come forward and say ‘I’m here, I’m talented and I have the skills you need to succeed,’” Requist said. Requist spearheaded Ontraport’s on-campus childcare and parental leave programs. She said that Ontraport, like many companies, has been impacted by the loss of talented employees who didn’t come back to work after having children. Pereira shared her twist on the “Balance for Better” theme. She said that it wasn’t easy to find work-family balance while raising twin boys and holding executive-level positions. Instead, she sought harmony by entwining her family life with her professional one. Management experts are viewing the leadership gender gap as not just a women’s issue, but a business issue as well. According to a 2015 report by the McKinsey Global Institute, a management consulting firm, if women were to participate on an equal level to men in the labor force, they could drive $28 trillion in increased global growth by 2025.